A raft of austerity measures government is mulling, which will, among other outcomes, lead to massive retrenchment, will hit civil servants hard and is contrary to President Emmerson Mnangagwa's electoral campaign promise to create employment. The wage bill, which gobbles up 90% of government revenues, leaves very little space for investment in major infrastructure development projects. Mnangagwa put further burden on the fiscus when he increased salaries of soldiers and the rest of the civil service by 22% and 17% respectively earlier this year. Then Finance minister Patrick Chinamasa said the tabled civil servants' salary hikes would increase the wage bill to 120% from its current levels and widen the country's fiscal deficit. Mnangagwa made the promise to create jobs, the cornerstone of his presidential campaign in the run-up to the disputed July 30 elections he won by a wafer-thin 50,6%. Among other promises, he claimed economic growth of around 6%, US$5 billion annual foreign direct investment inflow and US$10 billion of domestic investments, capacity utilisation to 90%, as well as 1,5 million housing units over the next five years. However, he has sung a different tune since winning the election, particularly on the all-important issue of job creation. In an article he authored in the British publication, the Financial Times, Mnangagwa vowed to implement tough austerity measures. "A large and inefficient public sector cannot be allowed to hold back private enterprise. We have set about cutting unnecessary expenditure, therefore. We are reducing the number of ministries, limiting foreign travel and perks for officials, and retiring or redeploying senior officers," he said. "The process of change is not smooth. Some pain and discomfort along the way is inevitable. The arduousness of the path of reform can sometimes lead governments to stall or backtrack. But as a passionate reformer leading a reformist government, I know there is no other way. We cannot allow anything to slow us down." In his pre-budget presentation to parliamentarians last week, Finance minister Mthuli Ncube revealed that attention would be given to wage containment measures when he presents his maiden budget on Thursday next week. Among other measures, the enforcement of the retirement policy, maintaining a freeze on filling non-critical posts as well as rationalisation of the foreign service missions. Mnangagwa's intention to drastically cut the civil service was apparent in Chinamasa's presentation of the budget, his first with Mnangagwa as president last year, where he abolished 3 700 youth posts. The job cuts in the civil service are a double-edged sword in that while they trim the wage bill, they worsen unemployment. The affected civil servants could be forced to join the informal sector. The retrenchments will add to the more than 2 000 workers who were laid off last year. 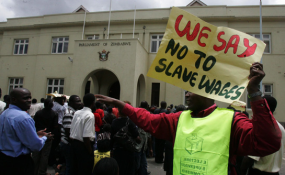 According to figures by the Zimbabwe Congress of Trade Unions, nearly 9 000 workers were retrenched in 2015 and 2016. Thousands also lost their jobs in 2015 after a Supreme Court ruling allowed employers to dismiss workers on three months' notice without paying a retrenchment package. Estimates of the number of workers affected by the ruling vary from 9 000 to 30 000.